The Business Languages programmes at the Language Centre, University of the Arts London, were to be launched at an event attended by heads of educational institutions, corporate training managers, London business network organisations, the media, Language Centre staff, friends and alumni. It promised to be a cosmopolitan evening. 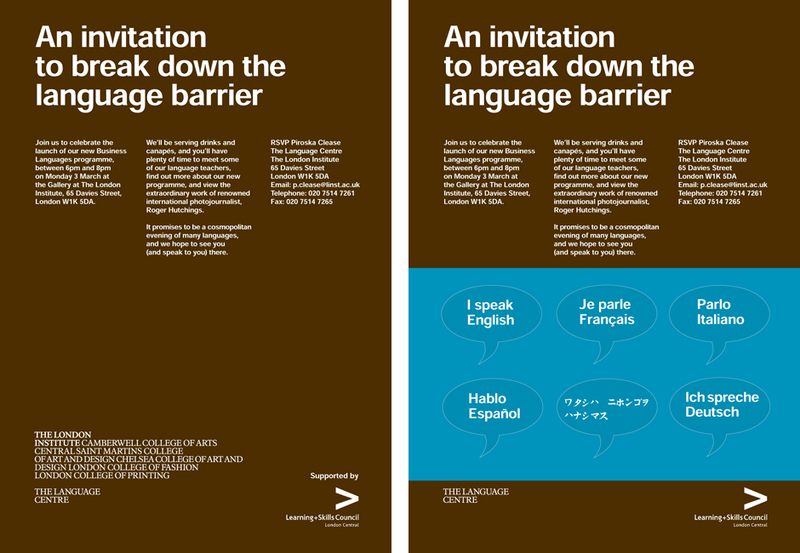 To begin the conversation we designed the invitation in celebratory silver printed on rich brown board and headlined it with ‘An invitation to break down the language barrier’. We added a turquoise wrapper with six speech bubble stickers, each carrying the message ‘I speak English/French/Italian/Spanish/Japanese/German’ in its respective language. Guests peeled off and applied stickers to themselves to indicate which languages they spoke.